Virtual New Zealand Stamps: 1979 - 1980 Scenic Stamps. 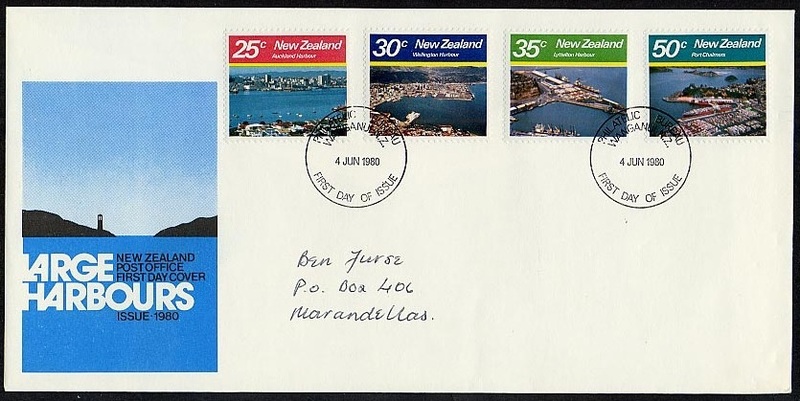 1979 Scenic Stamps - Small Harbours. 15c - Whangaroa Harbour, Northland. 20c - Bon Accord Harbour, Kawau Island. Whangaroa Harbour, Northland / Long Harbour - 15c. Whangaroa ('Long Harbour') between Maungonui and the Bay of Islands, on the eastern coast of Northland, is a spacious and perfectly land-locked anchorage, the result of a drowned river system. The narrow rock-walled entrance, scarcely a third of a mile across, is cut in hard volcanic breccia, while the upper reaches, over 2 miles in width and surrounded by gently undulating country, have been eroded in soft sedimentary shales and sandstones. There are extensive mangrove swamps at the head of the harbour, and some of the oldest fossils in the North Island, dating to the early Permian about 270 million years ago, are in the Whangaroa area. 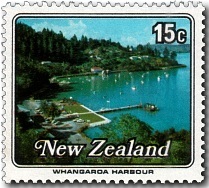 Today Whangaroa is chiefly known as a base for deep-sea game fishing. Kawau Island, whose name stems from the many shag colonies there, lies just off shore in the Hauraki Gulf, due east of Warkworth and 30 miles north of Auckland City. Approximately 5 miles long and 3 miles wide, the island is almost split in two by Bon Accord Harbour, which opens towards the mainland, so forming a fine natural anchorage. 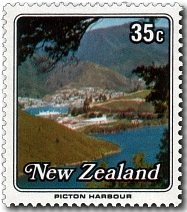 The scene depicted on the stamp is of Mansion Bay located in Bon Accord Harbour. 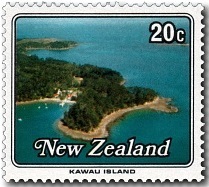 The island was bought by Sir George Grey, Governor of New Zealand, in 1862 as a private retreat. Grey extended the original copper mine manager's house (built 1845) to create the Mansion House, and made the surrounding land into a botanical and zoological park, importing many plants and animals. The house changed hands several times after Grey, and decayed increasingly, but more recently has been restored and refurnished to its state in the period of Governor Grey. It is now in public ownership in the Kawau Island Historic Reserve, administered by the New Zealand Department of Conservation. 23c - Akaroa Harbour. 35c - Picton Harbour. Situated at the south east end of Banks Peninsula, Akaroa is a busy fishing centre, both commercially and for pleasure. The harbour is a little over a mile wide at the entrance, and runs inland for a distance of a little over 10 miles, opening into various bays at its upper end. The entire harbour is the caldera of an extinct volcano. Surrounding the harbour are the towns and settlements of Akaroa, Duvauchelle, Barrys Bay, French Farm and Wainui on the shoreline of the harbour. Cruise ships occasionally enter the harbour, so their passengers can enjoying visiting Akaroa. Situated in an inlet of Queen Charlotte Sound, Picton is the main port of Marlborough and is the South Island terminal of the inter-island rail-car ferry. 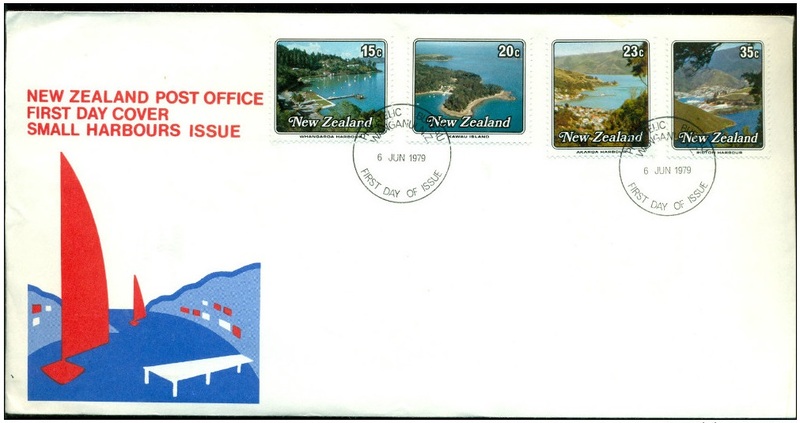 Terminal facilities established at the port came into operation in August 1962 and provide berthage for the ships maintaining a ferry service between Picton and Wellington for railway rolling stock, motor vehicles, and passengers. The famous author Katherine Mansfield spent time in Picton where her grandparents, Arthur and Mary Beauchamp, and her father Harold, lived for some time when they came from Australia. 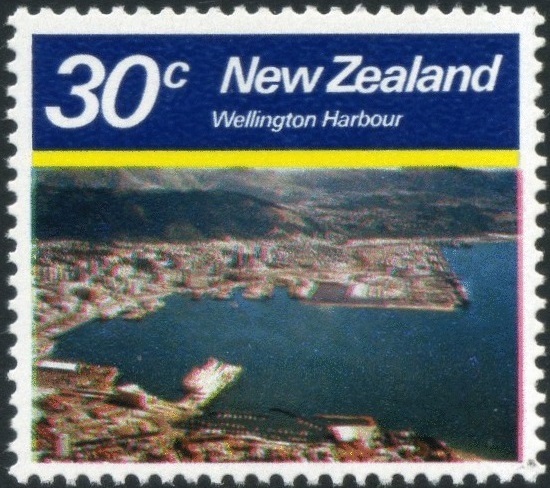 She included a reference to the port in her short story "The Voyage" (in the collection The Garden Party), which is "an account of a trip to Picton from Wellington on the Cook Strait ferry." 1979 Harbours 23c vertical pair with red offset on the back. 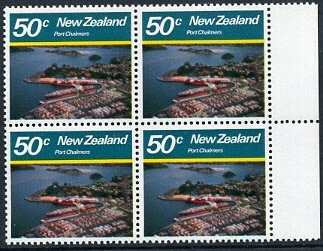 1980 Scenic Stamps - Large Harbours. 25c - Waitemata Harbour, Auckland. 30c - Port Nicholson Harbour, Wellington. The Port of Auckland is situated on the southern shore of Auckland Harbour, usually known as the Waitemata Harbour, adjoining the commercial area of the city. 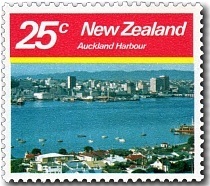 Because of the size of the industrial area it serves and its proximity to the rich farming lands of the Waikato, Auckland become one of New Zealand's most important ports although in more recent times the Port of Tauranga has been a strong rival for some of Ports of Auckland's business. The harbour is an arm of the Hauraki Gulf, extending west for eighteen kilometres from the end of the Rangitoto Channel. Its entrance is between North Head and Bastion Point in the south. The westernmost ends of the harbour extend past Whenuapai in the northwest, and to Te Atatu in the west, as well as forming the estuarial arm known as the Whau River in the southwest. Port Nicholson is a large natural harbour at the southern extremity of the North Island and on the north-eastern shore of Cook Strait. 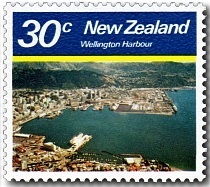 The harbour, the sea area bounded by a line between Pencarrow and Palmer Heads to Petone foreshore, was known as Port Nicholson until 1984. The harbour is land-locked with an entrance of just over 1.6 kilometres from shore to shore and, being surrounded by hills over 390 metres high, it provides sheltered anchorage in a region where wind velocities may exceed 160 km/hour. The depth of water over the great bulk of the harbour exceeds 10 fathoms. Three small islands are located in the harbour. To the south, close to Eastbourne, is Makaro / Ward Island. Further north, close to the centre of the harbour, is the larger Matiu / Somes Island, to the north of which is the tiny Mokopuna Island. The entrance to the harbour can be quite dangerous, especially since Cook Strait to the south is notoriously rough. Close to the harbour's entrance lies Barrett Reef, its rocks breaking the water's surface at low tide. It was here in 1968 that the inter-island passenger ferry Wahine grounded during a storm, with the loss of 51 lives. 35c - Lyttelton Harbour, Christchurch. 50c - Port Chalmers Harbour, Dunedin. 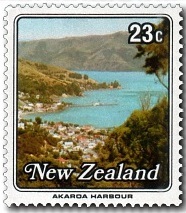 Lyttelton Harbour (Māori: Te Whaka-raupo) is one of two major inlets in Banks Peninsula, on the coast of Canterbury, New Zealand; the other is Akaroa Harbour (See 1979 Small Harbours above). Like Akaroa Harbour, Lyttelton Harbour is the drowned crater of volcanic eruptions. 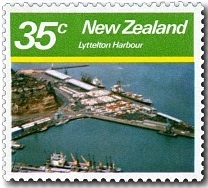 The Port of Lyttelton is the third port in New Zealand. For exports it serves the great primary-producing plains of Canterbury Province. The port is connected to the City of Christchurch by road and railway tunnels through the Port Hills. The inner harbour is situated about 6.4 kilometres from the entrance and is formed by breakwaters. 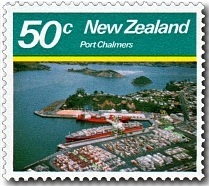 Port Chalmers is situated about halfway up the narrow channel of Otago Harbour. Over the years the Dunedin City waterfront, about 13 kilometres further up at the head of Otago Harbour, was the main port of Dunedin, but in more recent times this has changed. Port Chalmers is a deep-water port and containerisation has given it a new lease of life. Although the harbour beyond Port Chalmers is regularly dredged, most of the port activity is centred on Port Chalmers rather than on central Dunedin. Part of the reason for this is the narrowness of the Victoria Channel, the one part of the Otago Harbour navigable by large ships, which makes it far easier for berthing to take place at Port Chalmers, closer to the open sea. Any big ships venturing into the upper harbour wharfs need to be piloted in with the help of tugs. 1980 Large Harbours First Day Cover. 1980 Harbours 30c Wellington red colour shift, blurs distorts design. 1980 large Harbours 50c value with minor red colour shift, photo now fuzzy, red line in yellow band. Technical information - 1979 Small Harbours. Technical information - 1980 Large Harbours.